To get kids off their screens and playing outside again, the Unilever-owned laundry-detergent brand, Omo, also known as Persil in some markets, created a children’s book, which kids can only read when its pages are smeared with dirt. It is part of Omo’s ongoing ‘Dirt is Good’ campaign. 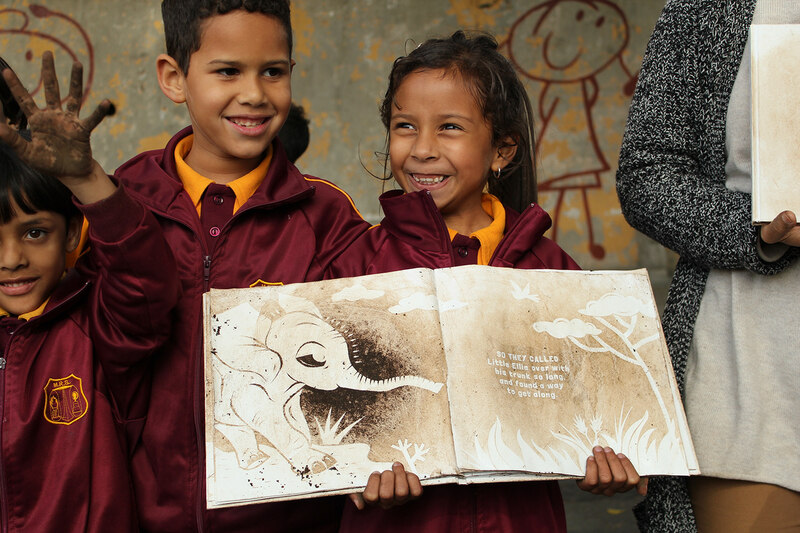 The dirt-activated book, called The Tale of Spots and Stripes, is the result of a collaboration between Ogilvy South Africa in Cape Town, Karabo Poppy, the tales artist, and Colourtone Aries, the printing specialists that created the ink formula. The ink formula does not fill the blank book with beautiful illustrations until it is touched by dirty hands. Since being launched in a number of schools nationwide, the project has received the support of Educanda, South Africa’s leading supplier of child development tools and school learning equipment and the Centre for Early Childhood Development. Omo is currently talking to the country’s Department of Education in hopes that South Africa’s government makes the book part of the curriculum. Today, children are surrounded by and glued to their screens and monitoring this screen time has become a modern-day issue for parents. The impact of an unhealthy amount of exposure to digital products and services has become a growing concern as it can lead to emotional, health and social problems. This is why The Book of Dirt is so great – it entices children outside, demonstrating that dirt is good and time away from the screen is beneficial. Currently, users receive an average of 1 to 5% of a single share per purchase. However, this depends on the brand because the brand decides its share reward percentage, while Bumped handles the logistics of buying the shares from capital markets. Not only is this app getting more of the population to take part in the stock market (especially us 20 somethings) but it is also building stronger relationships between the consumer and brands they love. By feeling they have partial ownership of the brand, they are more likely to advocate on behalf of the brand. When it comes to making Christmas wish lists, children tend to favor the must-have toys such as my little pony, toys based on their favorite shows or technologically advanced gadgets. To identify what precisely these in-demand toys of the Christmas season would be, CHE Proximity in Australia monitored search data, retailer purchase data and toy sales predictions. The next step was to use this insight to remind parents (or anyone else buying a gift for children) that Lego is a versatile toy that encourages children to use their imagination. The way they did this: every time someone searched online for one of the in-demand toys they would be presented with an ad showing the toy in question built from Lego bricks. As the gift giver went from site to site, advertisements of the bricks being constructed into different items continued. By targeting the adults who are buying the Legos, rather than the children, Making The List campaign appealed to the educational and long-lasting qualities that parents love about Legos. And clearly, it was successful as this campaign quadrupled the sales of the Lego between October and December 2017. While this is not entirely a new idea, considering Maserati used data-based targeting to offer Germans a test drive to a rival dealership in 2015, it is a successful tactic. Lego’s campaign both reminded parents that their product is a versatile alternative to fad-toys and successfully redirected their attention. PayPal wanted to reinvent themselves for a millennial audience, and their solution was genius. With the help of CP+B, LA, they realized that researching and purchasing an item were equally exciting and that during this process, many millennials turned to social media personalities. As a result, PayPal leveraged their network of merchant patterns to create Local Selects – a live stream shopping experience allowing web users to explore and buy products from the world’s most popular markets. By partnering with Leandra Medine, founder of Man Repeller Blog, and comedian Matt Okine, shoppers were able to livestream and experience famous flea markets in Los Angeles, New York, and Sydney as well as independent designers and their products through Medine’s and Okine’s entertaining eyes. This experience was livestreamed through Facebook Live and a dedicated campaign microsite. The purchasing aspect came into play when Medine or Okine picked up a product because the item was then instantly displayed on the campaign microsite, giving people the option to buy it in real time. According the agency, the livestream was most popular with 25-34 year-old-consumers – the group PayPal wanted to reach – and one business owner said that they saw a 31% increase in PayPal transaction compared with a usual day. PayPal plans to continue this initiative in the future, making London’s Camden Market their next stop. Local Selects is an entirely new way of shopping that will not only increase the number of people using PayPal but will also give independent designers the ability to reach a broader market that they had no way of accessing before. And of course, the consumer benefits by gaining access to new and trendy designers that they would most likely not have been able to shop at before. Even more so, it’s a new channel for social media personalities to shine and attract new fans. Fuzzy Pet Health mobile app, a subscription vet care service providing in-home vet visits to subscribers in the greater San Francisco Bay Area, is now offering Fuzzy Pet Health Connect, a telemedicine vet care plan for $10 a month. This new feature provides access to veterinarians directly from your phone, any time you need immediate medical advice, expert recommendations or behavioral tips. All you need to do is send a text, picture or video with your questions and concerns, which allows your to skip an unnecessary visit. However, if the problem requires an in-person visit, the vet will recommend it. Though, 80% of the time when people think there’s an emergency issue, it’s not actually critical. ‘Unfortunately, laws in most states won’t allow for diagnosis and medications to be subscribed over telehealth services when it comes to pets — a bit unusual, given that people now have access to a variety of video chat doctors-on-demand offerings.’ Right now only Washington D.C., Alaska, Connecticut, and Canada allow vets to diagnose and prescribe digitally. However, laws are starting to change. Nobody likes being stressed or worried about whether they are making the right choices when it comes to someone else’s health and in most cases when a concern arises, the owner will either be brought down by worry or take an unnecessary trip to the vet. This is why the ability to quickly ask a professional and rely on their advice is such a great solution – especially if it stays at such a low cost. The average pet parent goes to the vet only 1.6 times a year, while the members of Fuzzy Pet Health Connect get in touch with the vets roughly once a month, which shows that owners have constant questions. Fuzzy Pet Health Center not only puts the owner at ease but saves times and maybe even lives. 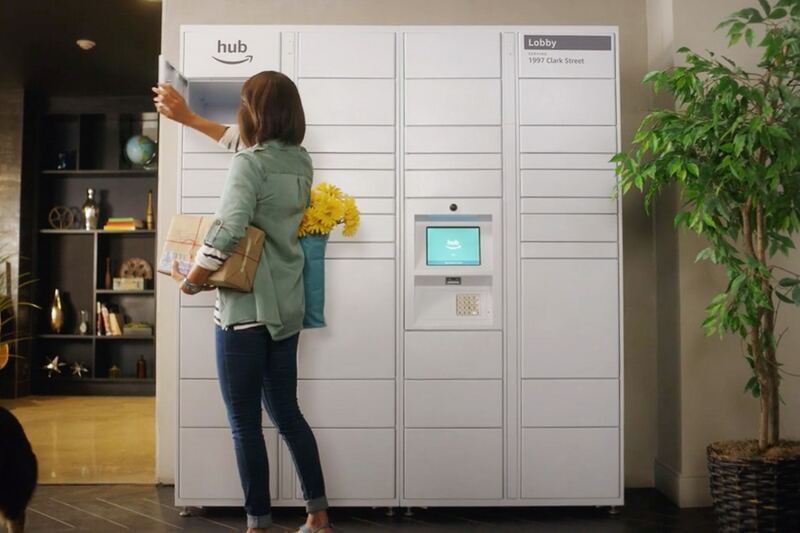 The Hub, Amazon’s new delivery locker for apartments, is now being offered to building management companies around the country. Last July, Amazon launched the program, which places a large metal locker unit in a common area of an apartment complex where people can pick up their packages 24 hours a day. Now (as of this past Tuesday) Amazon officially announced that over 500,000 residents across the country who live in buildings managed or owned by AvalonBay, Fairfield Residential, Pinnacle, J.P. Morgan Asset Management, WinnResidential and Equity Residential, already have access to the Hub, and thousands more are getting access each month. A delivery is sent to shoppers’ usual address. Upon delivery to the Hub, the intended recipient gets a code sent via email or text. They then enter the code into the machine, and a door pops open to reveal the package. While this might sound similar to the Amazon Lockers delivery storage that was launched back in 2011 at public pickup stations including grocery stores, gyms and convenience stores, the Hub, unlike the Amazon lockers, hold packages from any sender. Some of the biggest complaints that companies like USPS face, is that customers will stay home from work all day waiting for a package and in some cases, they still do not even get it. This issue is also a pain point for the sender, as they often have to resend a package that has been lost or stolen. Amazon is tapping into a massive market by offering the Hub as a solution for both the online shopper and the sender. Further, building owners also benefit, as the device could be useful for keeping hallways and package rooms relatively clear – in other words, who wouldn’t want this? Taco Bell is Serving Frosé! 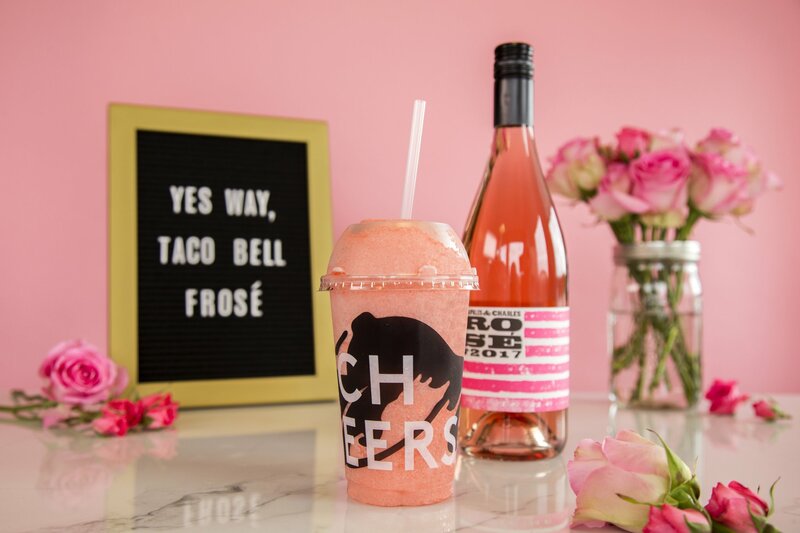 On June 6th Taco Bell announced that they will be testing Berry Frosé (frozen rose) at two Taco Bell Cantina locations in Newport Beach, California, and Chicago. The drink combines frozen rosé features blended with berry flavors. The frosé will cost $7.99 at the Newport Beach Cantina and $5.49 at the Chicago location. Taco Bell is continuing to give the millennial what they want. In 2015, Taco Bell launched its first Cantina, which features designs geared towards foot traffic (no drive-thru) and offers beer and mixed drinks. Cantinas are especially appealing to the millennials, with their digital menu boards, trendy décor, DJ’s blasting music and tapas style appetizers. And now, by adding Frosé to the menu, Taco Bellis even more in line with the millennial. It will no longer be a late night treat or stop on the road, but instead, it will be a destination. The fast-food chain isn’t doing something new (think Pinknic) but they are following a smart trend. “Rose All Day” has become a cultural movement and by joining in, Taco Bell is sure to gain traction. Why Wait In Line and Miss the Show If You Can Order Ahead? Apple is teaming up with music festivals so people can order their drinks ahead with Apple Pay. Users simply use the festivals app, pick the bar they want to order from, choose their drink (or drinks) of choice and then checkout using Apply Pay. After ordering, the user receives a notification with an order number as well as a map to the bar. This means concertgoers no longer have to miss the show or lose their friends because they are waiting in long and slow-moving lines. Ordering ahead and skipping the line is not a new concept, considering most people use this feature daily (for example, at Starbucks). However, bringing this feature to concerts is something entirely new. 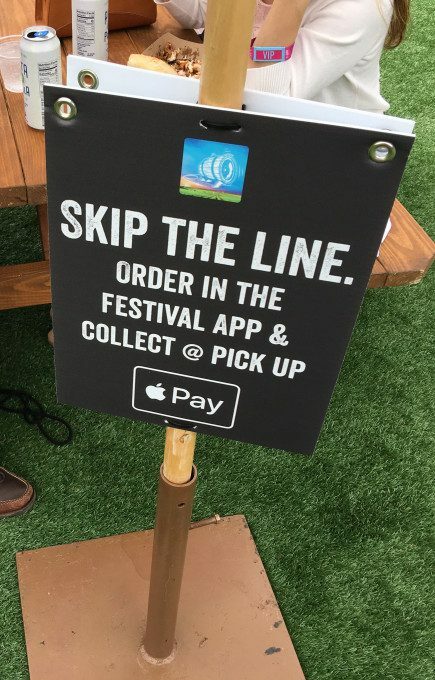 This year at BottleRock music festival, ordering ahead with Apple Pay was offered for the first time, and it was a huge success. This feature has massive potential because what concert goer would rather wait in line than walk right up to their bar of choice and have their drink paid for and ready to go. Time is precious and one long line can lead to missing out on the experience. Additionally, the vendors will benefit too as concertgoers are more likely to buy drinks if they do not have to stand in line. It is a win-win for all involved!